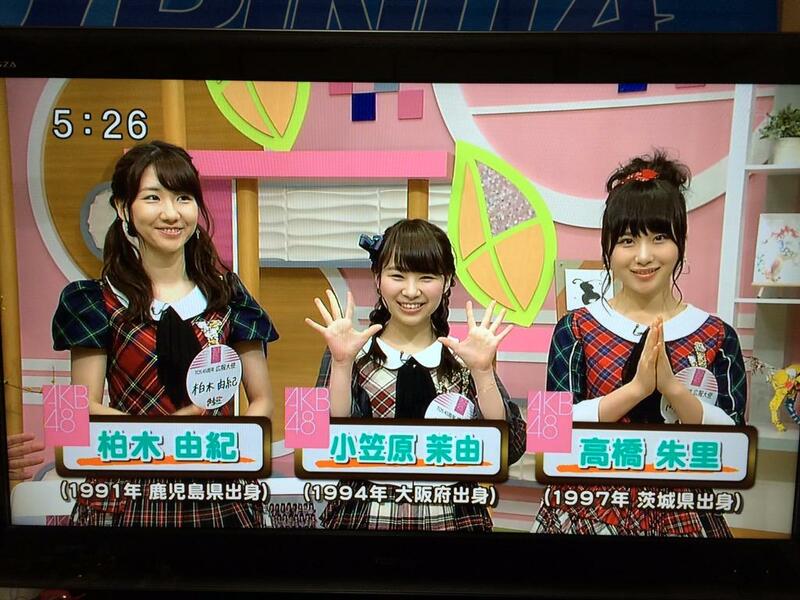 Yukirin came back from Singapore only to leave the next morning to Oita along with Juri and Maachun. They were there as TOS45 Anniversary Ambassadors. Each month, a few AKB members have gone there to promote. The three visited the small town of Yufuin in Oita. The three also appeared live on a tv morning show “You~waku Wide” and of course ate various snacks! Yukirin said in her tweet, “I’m in an unusual hairstyle right?” Yukirin wore twin-tails! Akicha replied to Yukirin and said she looked cute in that hairstyle! The weather wasn’t good in Tokyo so their flight home was delayed. Yukirin and Juri updated their 755 quite a bit.Looks like Juri had lots of fun with Yukirin. She received a kabe-don from Yukirin! Yukirin returned to Tokyo and wished Yamada Nana congratulations on graduating. 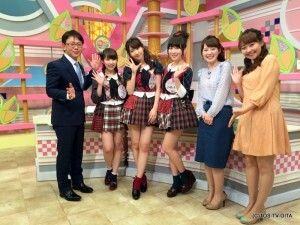 Not sure if I’ll be able to find the video of their segment of the show. If I do, I’ll link it here. And then I remembered that these two were split by the evil organisation. Also Yukirin kabedon is a must see. She did it on tour (tthe one not on the DVDs of course because evil, and now This?! Pics or it didn’t happen Juri.